To ring in "A Year of Play", Landmark has unveiled The Prosperity Playground. 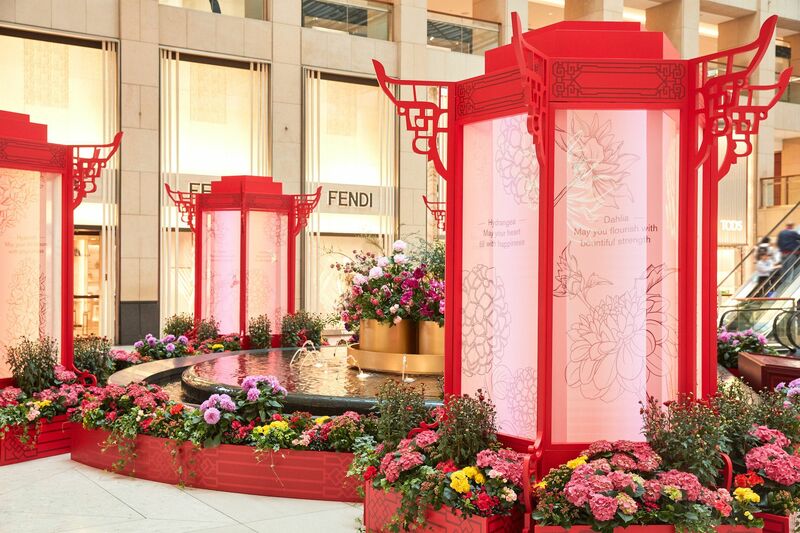 Designed to evoke childlike wonder, the installation is set within a garden and features soaring Chinese lanterns. On the lanterns, different flowers are painted along with their unique symbolism and heartfelt wishes for a happy, healthy and prosperous Year of the Pig. The Prosperity Playground kicks off Landmark’s “A Year of Play” in which they encourage people of all ages to let their hair down, explore, enjoy and most importantly, play, as they explore the three concepts; self expression, imagination and celebration. What better way to start Chinese New Year than by sprucing up your look? From whimsical jewellery pieces by Chanel to out-of-this-world handbags by Gucci—oh, and let's not forget the return of the iconic Fendi Baguette bag, which is sold exclusively at the maison's Landmark store. In the world of fashion, shoes can be the ultimate form of self expression, so put your best foot forward with this season's playful designs. Be it sophisticated chic looks by Jimmy Choo and Monolo Blahnik, or streetwear-inspired looks by Loewe. Take a break from the basics and, in the wise words of Charles Wright: express yourself! A big part of play is allowing your imagination to run wild—and on the subject of wild, don't miss Louis Vuitton's psychedellic Carre Superstition scarf which features all the animals of the Chinese zodiac. Landmark invites you to envision an array of style possibilities with unique fashion pieces that will have you reimagining what "style" means for the entire family; from rainbow-handled bucket bags by Marni, vintage-inspired varsity jackets by Kent & Curwen to adorable kids' clothing sets by Petit Bateau. You can also head to Bookazine for a little food for thought with the feel-good Playground of Possibilities deck of cards, or indulge in Forest Bathing, Dr. Qing Li's guide to the Japanese practice of shinrin-yoku. When it's time to celebrate, there's always a feast involved and Chinese New Year is no exception. Satisfy your sweet tooth at La Maison du Chocolat with their impressive Fortune Hatbox filled with sinful delights, or head to The Cakery for a more traditional dessert with their rice cakes, turnip cakes and Chinese New Year-themed cookies featuring exquisite designs. The Cakery will also be serving a sumptuous vegan tea set for two. For a luxurious traditional Chinese New Year feast, head to the artfully designed China Tang for a sophisticated take on Cantonese classics, including all of the lucky dishes you need to usher in a year of good fortune and happiness. Download the Landmark HongKong app or visit landmark.hk to discover more.